SAN FRANCISCO (AP) — California Gov. 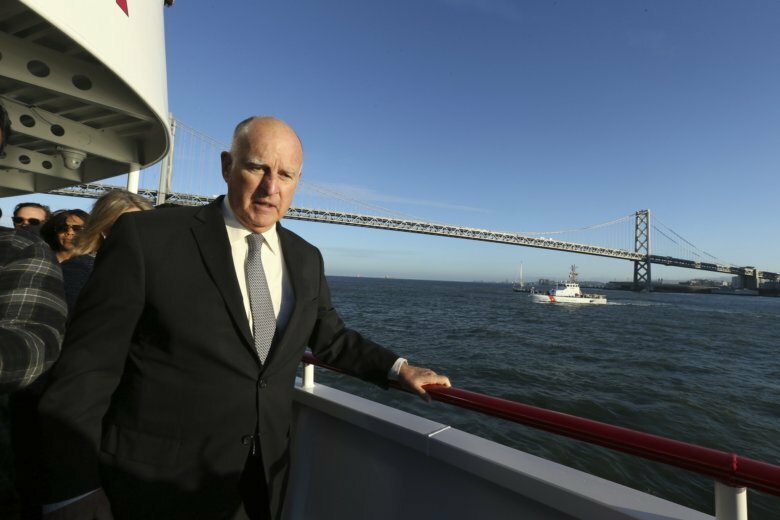 Jerry Brown used a high-tech battery-operated San Francisco Bay sightseeing ferry as the backdrop for approving 16 new laws Thursday aimed at easing global warming. The bills he signed into law aim to increase the number of zero-emission vehicles and charging stations and reduce the number of heavily polluting cars and trucks. The effort is key to California’s goal of reducing greenhouse gas emissions because pollution from vehicles has risen even as emissions from other sources drop. Transportation is the largest contributor to California’s greenhouse gas emissions at about 50 percent and accounts for about 80 percent of smog-causing pollution. While other sectors have declined over time, especially emissions from power plants, the California Air Resources Board said transportation emissions rose 4 percent between 2014 and 2016. Among them are measures encouraging consumers to purchase used zero-emission vehicles; encouraging van pools for agricultural workers; targeting low-income residents and heavy-duty vehicles including school buses for clean-vehicle incentives; and developing emissions reduction targets for ride-hailing services. The Democratic governor signed the measures as he hosts a summit in San Francisco of climate change leaders from around the world. It comes days after Brown approved California’s new goal of phasing out electricity produced by fossil fuels by 2045. He signed the bills during the maiden voyage of the San Francisco Bay Area’s first plug-in hybrid electric ferry, dubbed the Enhydra after the Latin name for the sea otter. The 128-foot-long Red and White Fleet sightseeing ferry can carry 600 passengers on its three decks. Brown said eight of the bills he signed would aid lower income areas affected by pollution, promote buildings that generate as much energy as they use, encourage the use of less harmful gases in refrigerants, and boost penalties for new trucks equipped with older, higher-polluting engines. Brown, who leaves office next year, is promoting California as a global leader in combating climate change, but some critics say he has not been doing enough particularly to curb the extraction of fossil fuels. The nonprofit groups Consumer Watchdog and Food & Water Watch earlier this week aired a 30-second television advertisement featuring a 9-year old girl chastising Brown for not blocking oil drilling near homes.